Sergio Ramos has a magical forehead imbued with the power to score clutch goals. This head of his brings unending joy to Real Madrid fans, despair to opponents and rivals, and is arguably the most valuable body part in Madrid this side of Cristiano Ronaldo’s priceless right leg. 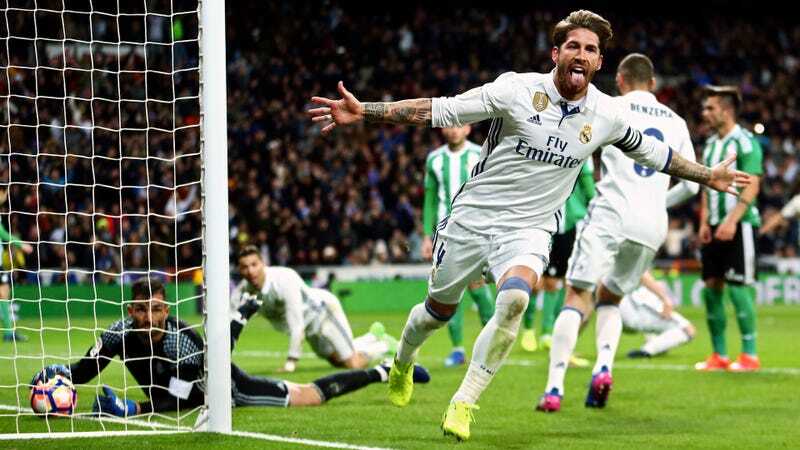 Since scoring THAT goal in the 2014 Champions League final—one that will forever haunt the dreams of cross-town rivals Atlético Madrid—Ramos has scored 23 goals, 19 of which have come when Real were either tied or down by one. When the moment is biggest, when Real are most desperate for a goal, is when Ramos comes to the rescue. The biggest reason why Ramos is able to do this time and again is the same reason why plenty of people find Ramos to be insufferable: He has an almost insane confidence in his own ability. Legend has it that when Luis Aragonés first called an 18-year-old Ramos up to the Spanish national team, he told a group of journalists after the very first training session that “the kid had balls bigger than Espartero’s horse” (Espartero was a Spanish General, whose statue in Madrid is famous because the horse has giant nuts). Sergio Ramos is so confident that he did a panenka in the penalty shootout of a Euro semifinal just weeks after skying a penalty in the the penalty shootout in a Champions League semifinal, inspiring hundreds of memes. Ramos just knows that if there’s a corner late in the game, and his team needs a goal, he is going to score it. Scoring from a corner is as much about pure belief as anything else. Everyone is in the box. You have to be the one to attack the ball and fight your way to it before anyone else and score. Scoring headers isn’t all will and passion, of course. Ramos is also an expert at judging a cross’s flight path. Take a look at his goal against Betis again. Watch as five players misjudge Toni Kroos’s delivery and take a step towards the near post. Ramos, who is running in from behind, attacks a spot in the box that’s about two yards behind them. The cross sails over their heads and right onto Ramos’s forehead. Goal and game over. Just last week, Ramos played the hero again in the Champions League with two headers that led to goals in five minutes to put down Napoli. Earlier this season he scored the game tying goal in the 89th minute of the Clásico at the Camp Nou (not for the first time in his career). Just a week after that he did it again in the 89th minute, this time a winner against Deportivo la Coruña. He also crushed Sevilla’s hopes for a European Supercup title with a goal in the 93rd minute that sent the game into extra time. Most defenders would be happy to have amassed a collection of big goals like that over an entire career, but that’s all just this season for Ramos. Without his goals, Real Madrid would be in 3rd place in La Liga, 7 points behind Barcelona. He’s Madrid’s joint third-highest scorer this season in the league. And he’s been at it for a few years now. He’s scored in two different Champions League finals against Atlético Madrid. He scored twice at Bayern Munich in a Champions League semifinal. Ramos even has more goals in his career (81) than Andrés Iniesta (72), which is just weird. It certainly helps to have a cyborg like Kroos delivering perfect crosses on each and every set piece. In fact, Kroos has assisted Ramos five times this season, making it the most fruitful partnership in La Liga, more than any combination between Messi, Suárez, and Neymar. Just over a year ago Madrid were reportedly close to selling Ramos to Manchester United during a contract dispute. Now the club wouldn’t think of selling him for all the money in the world. He’s saved their asses too many times to even entertain the thought.